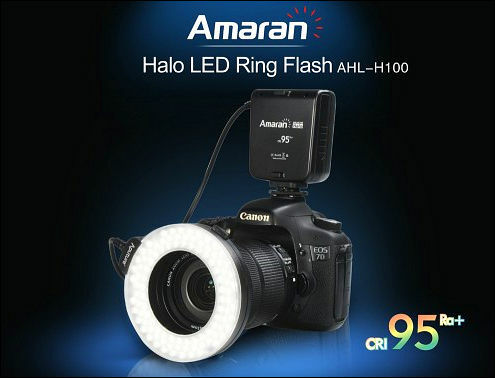 Shenzhen, December 2013- Aputure is pleased to release our superior Amaran Halo LED ring flash AHL-H100. It will be the first CRI 95+ ring flash in the world. Amaran H100 uses brand new led color rendering technology for critical applications. H100 has high color rendering index (CRI 95+) leds gather in 1 compact ring, providing double output to previous model (60 leds). Higher CRI makes Aputure CRI95+ ring flash is ideal solution for macro photography including nature, medical and scientific photography. @Vitaliy -- Will it be on the deals page ? Do you need one? As we usually do not have photo equipment on deals. @vitaliy - If I read the blog correctly it has a continuous mode that is 50% of flash mode, which could give about 150 lux @ 1 metre. So I'm thinking that it might be useful for video work. If the price is good I'd try it just to see!